Stamped concrete can be defined as the embossed, textured, patterned concrete material that resembles stone, tiles or other textures and patterns. A home can be made luxurious when its look, especially on the landscape is distinguished from the neighborhood. One of the best ways to achieve this objective is by installing stamped concrete. For this reason, stamped concrete will be the main theme for homeowners and the good thing is that it comes in a broad range of textures, colors, and patterns. The first question you could be asking yourself is where you can use this surface material. Stamped concrete can be used at home on sidewalks, interior flows, pool decks, driveways, and patios. It’s like you can use it on nearly all surfaces in your home. The material is quite affordable compared to other construction materials such as stone, slate or bricks. The beauty of it is that you will still get high-quality flooring from stamped concrete. There are several ways in which this type of concrete is designed that can suit your tastes and preferences. It is critical to find something that corresponds to your embellishing style which is highly practical with minimal exertion. A place which is perfectly patterned whether inside or outside gives a positive impression to a home. This is what stamped concrete is good at achieving in your modern home. There are professional methods used in stamped concrete which makes it unique from other concrete procedures: These include the addition of base in color, stamping a pattern in the concrete and adding an accent color. These procedures will give a color and shape that is similar to a natural building. This will also bring out the desired style in your home. One of the techniques that experts are doing to change space wasted and dumped into a haven is by resurfacing a patio or a basement and getting a stamped concrete place. The good news is that it offers several choices and its very viable option while creating your space. You can try it now and you will not have any regrets. There are several benefits that can motivate you to go for stamped concrete. First, the material is easily accessible at your location, therefore, you can choose the elements that you will use to craft a space that rhymes with your style, interest, and taste. This could be the driveway that proceeds from the gate to the parking or a patio that seems to be flowing to the pool, a space that reflects a landscape. You can choose as many designs as you want and the only limitation could be your budget. Another benefit is that the value of a home goes up in case you want to sale. Therefore, stamped concrete is very good when you want to add value to your home. Other concrete can appeal but the stamped concrete is more appealing and it brings a higher return to your investment. What makes the latter more desirable is that it is less expensive than other flooring options available in the market. It gives you the best way of enhancing the overall appeal of your home without having to break the bank. Stamped concrete is one of the best decorative styles that will bring a unique look to your concrete structures. There are various molded shapes that are used to stamp the concrete mixture so as to give it a uniform stamped look. The contractor then pours the concrete mixture on the construction area before spreading and leveling it. The expert then allows the excess bleeding water to evaporate from the concrete surface. The concrete surface is already stamped when it is firm enough to support a depression of ½ thumb inches. There is a broad range of stamps in the market including wooden stamps and rubber stamps among others. Put the first stamp on the concrete surface and press it just enough and not too much with the aid of your hand. Fit the remaining stamps in line with the first and consequent ones until you cover the intended area. You should undertake this process with utmost care so that you don’t affect the other stamps. You can add concrete sealers if you want to enhance the durability of your stamped concrete surface. It’s inexpensive to apply stamped concrete because these products are readily available in the market in any shape. 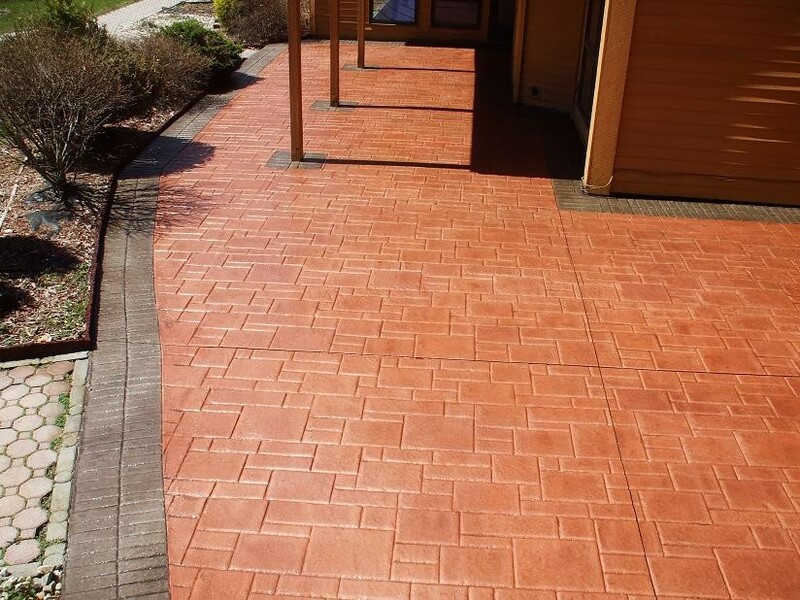 Its one of the best way to give a great look to your patios and pavements. You can also make dual or single colors in this form. This type of concrete is highly susceptible to the deicing agents and hence deteriorates very fast. Stamped concrete also loses its luster and sheen faster than the other types of concrete.